Over the weekend, contractors completed a foundation pour at Residences by Armani Casa in Sunny Isles. The pour started at 2am on Saturday morning and lasted until 9am Sunday morning, about 31 consecutive hours. Approximately 13,200 yards of concrete was used, making it one of largest continues foundation pours in South Florida history. 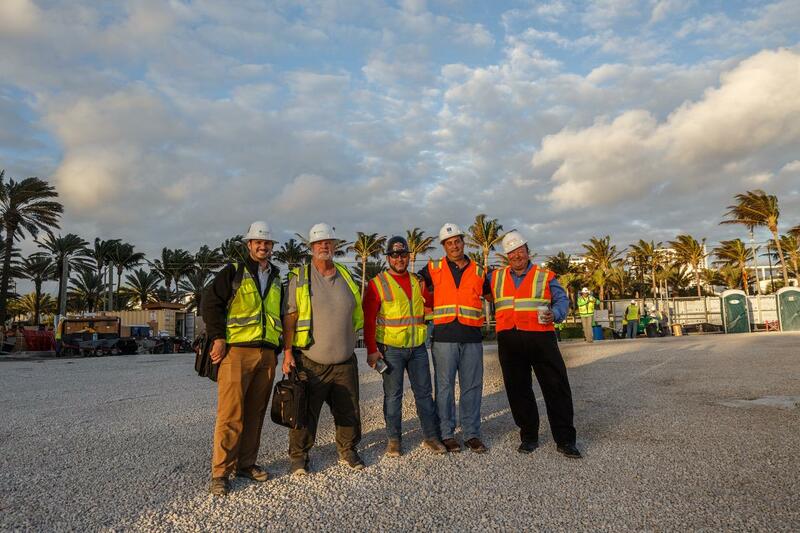 Sunny Isles Beach, FL (January 17, 2017) – More than 1,400 concrete trucks poured 13,200 cubic yards of concrete over the course of a 30-hour span utilizing a crew of more than 180 members to lay the foundation for the highly-anticipated Residences by Armani/Casa in Sunny Isles Beach. This event marked a significant milestone for Armani Casa’s first branded real estate project in the United States which is slated for completion in the first quarter of 2019. On Saturday, January 14 at 2 a.m., Coastal Condominiums, a division of Miami-based Coastal Construction Group – one of the largest general contractors in the Southeast – led the concrete pour of the iconic Residences by Armani/Casa, which utilized over 13,200 cubic yards of concrete and 2,000 tons of reinforcing steel to fill the 14’ thick Mat Foundation which is located 20 Feet below grade for the ultra-luxury, 56-story tower. 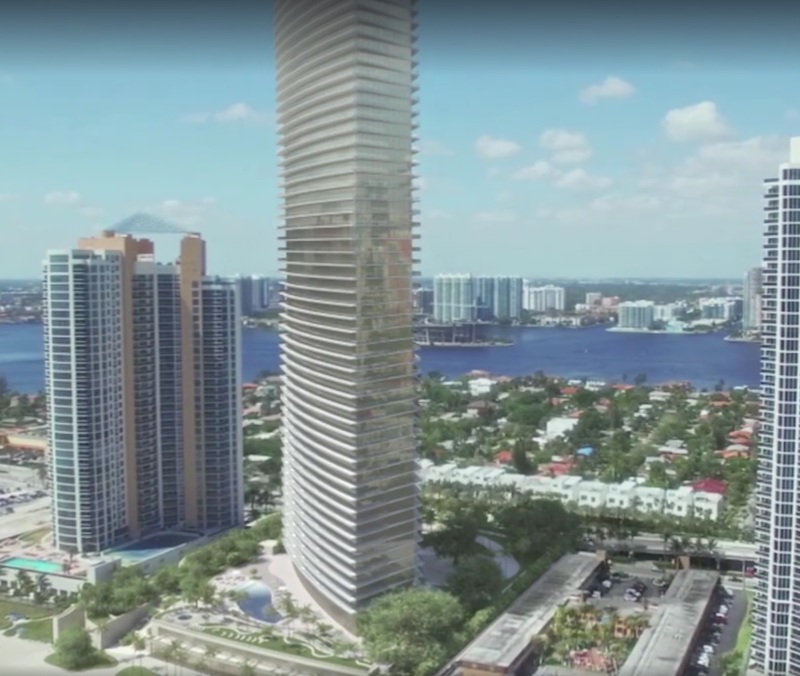 Dezer Development and The Related Group were joined by brokers, city officials and VIP guests at Residences by Armani/Casa’s state-of-the-art, oceanfront sales gallery for a viewing party that commemorated the concrete pour of the landmark tower. When completed in 2019, the tower will feature over 35,000-square-feet of incomparable amenities across two floors, all exquisitely designed and custom-furnished by the world-renowned Armani/Casa Interior Design Studio under the artistic direction of Giorgio Armani. Appealing to the most sophisticated of buyers, Residences by Armani/Casa’s amenities include a Lounge on the lobby level and a Prive area, a fine dining restaurant, cigar room and wine cellar, heated swimming pool, ocean-facing fitness center, two-story revitalization spa with indoor and outdoor treatment rooms, movie theatre and clubroom, and exclusive beach amenities on a 300-foot stretch of private shore. The natural splendor of Residences by Armani/Casa’s pristine beachfront is further complemented by a three-acre garden oasis designed by the tower’s award-winning Swiss landscape artist, Enzo Enea, as well as monumental sculptures by internationally celebrated artists, Sandro Chia and Boaz Vaadia. Ranging in size from 1,350 to 4,160-square-feet, the well-appointed residences are priced from $2 million to over $15 million. Congrats Related and Dezer!! Amazing job!! People seem to have a short memory. Miami Dade citizens have historically voted down gambling again and again. It seems that somebody wants to shove it down their throats nonetheless …pathetic! I like how on the final rendering the remove the two to three story motel that sits just to the north of the property between the property and Ocean Two. I’m sure the neighbors appreciated the 2am start.